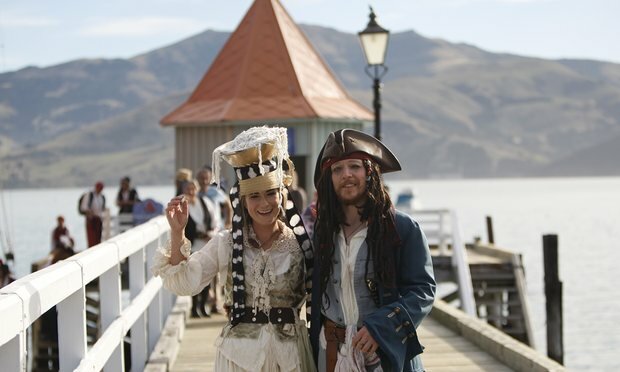 The world’s first Pastafarian wedding between a British groom and New Zealand ride has been held aboard a pirate ship in New Zealand. Pastafarians belong to the Church of the Flying Spaghetti Monster (CFSM), which the New Zealand government approved to conduct legal marriages in 2015. The church believes a god made of spaghetti and meatballs is just as likely as other gods. According to its website, its only dogma is ‘the rejection of dogma’. British man Toby Ricketts and New Zealander Marianna Fenn have been together for four years. Although they never considered marrying before, when the first Pastafarian marriage celebrant was sanctioned by the country’s government they decided the chance to hold a humorous and original wedding was too good to pass up. The bride and groom wore head-to-toe pirate regalia, and guests donned eye-patches, pirate hats and feathers for the ceremony which took place over the weekend. Fenn also wore a colander on her head – the official headdress of the church. During the ceremony, Ricketts and Fenn exchanged rings made of pasta, and in his vows Ricketts promised to always add salt while boiling spaghetti. The total cost of the wedding was NZ$3,000 (£1,460), and the couple supplied the wedding feast – 15kg of tomatoes from their garden, vegetarian meatballs, and plenty of pasta and bread. The couple are the first to be married by CFSM marriage celebrant Karen Martyn who said she has at least a dozen more weddings lined up this year. Oh my goodness, how hillarious! And it wasn't an April Fools' Joke, right? This guy looks just like Jack Sparrow!